John lost his father, his mother, and his arm … but never his sense of equality. 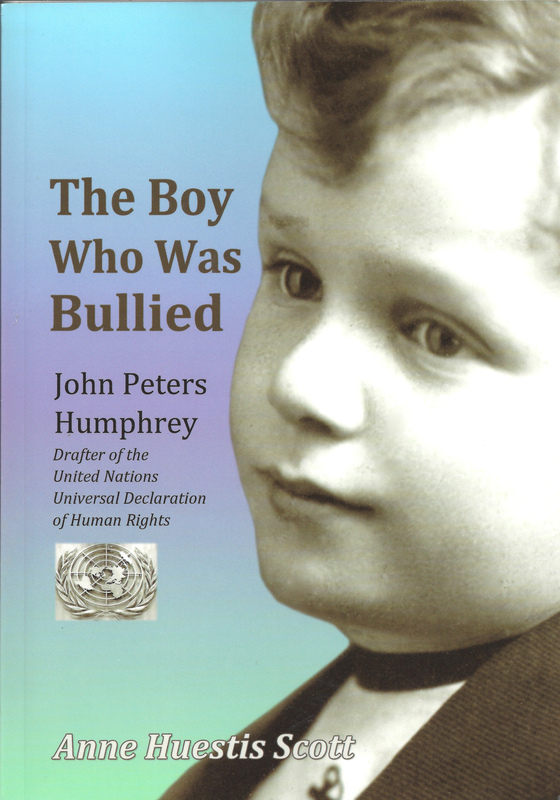 “The Boy Who Was Bullied” illustrates the importance of early influences in the life of this amazing international hero. John a perdu son père, sa mère et son bras… mais jamais il n’a perdu son sens de l’égalité pour tous. John Humphrey grandit à Hampton, au Nouveau-Brunswick, au début des années 1900. La perte de son bras, à l’âge de six ans, fit de lui la cible d’intimidation. Confronté à de nombreuses épreuves, John fit preuve d’une détermination et d’une résilience qui le guidèrent tout au long de bien des aventures vers une carrière exceptionnelle. Au cours de sa vie adulte, John fut doyen de la Faculté de droit de l’Université McGill, puis directeur de la Division des droits de l’homme, aux Nations Unies, à New York. Il rédigea la première ébauche de la Déclaration universelle des droits de l’homme, adoptée en 1948 par les Nations Unies et qualifiée par Eleanor Roosevelt de «Magna Carta de l’humanité». «Au-delà de l’intimidation » démontre l’importance des premières influences présentes dans la vie de ce grand héros international. Anne, well done…..very proud of all that you have accomplished. Your book is wonderful and it is very good to see fantastic research in NB. JP Humphrey was a great man but except for the tradition of being named after the father he could have been a Peters or an Armstrong after the female line. I am his second cousin even though I am a female called Anne Bower (born Anne Armstrong), father Aubrey Armstrong born SJ 1895, his father Andrew around 1840 and Andrew’s sister Elizabeth gm of JPH who of course being a female born in NB around 1845 has had her name disappear into the waves, even though she is the gm of JPH. SBI. Thank you, Anne. I am just reading this for the first time. Interesting to know that you are JPH’s second cousin. I had a book on children’s rights published in April, 2016. It’s called, “Let’s Make It Right”, A Book that Explores the Rights of Children Around the World. The book includes over 90 photos of children from 26 countries around the world. I am in the process of trying to update my website to include information on my new book.